For expansive views with an extra helping of style and grace, choose a bay or bow window from Huff ‘N Puff. Your home will look more beautiful inside and out! Bow and bay windows are two unique and different window styles that share many characteristics. Each offers advantages when your home improvement plans call for a window replacement. 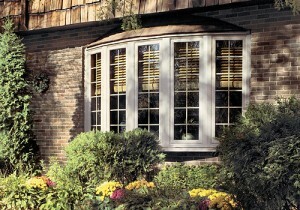 Homeowners can get help in choosing between bow and bay windows from the replacement window experts at Huff ‘N Puff. Bay windows are typically made up of three window panels. In most examples a large, fixed center pane of glass is flanked by opening casement, double-hung or single-hung panels that are installed at a slight angle. This causes the entire window unit to extend outward from the exterior walls of your home, creating additional interior space in the form of a shelf or, in some cases, a seating area. Bow windows extend from the exterior walls of your home in a gently arcing shape. They usually consist of four or more window panels. These panels can be fixed, a casement window that opens outward, double-hung or single-hung with opening sashes, or a combination of any of these styles. Whether you choose bow or bay windows, Huff ‘N Puff offers a wide selection of traditional and specialty replacement windows for area homeowners to choose from when designing their windows. A bay or bow window can dramatically change the exterior appearance of your home, at a fraction of the cost of major renovations. Contact Us for a Free Estimate on Bow & Bay Windows in the Hudson Valley and Capital Region! Give your home a new look with a bay or bow window from Huff ‘N Puff. Complete our convenient online price quote request, or call us today at (855) 483-3678 to get a free, no obligation estimate on a bay or bow style for your home.